Cattle smuggling to Bangladesh from India continues unabated with the Border Security Force (BSF) seizing over 32,123 cattle till August this year alone in lower Assam’s Dhubri sector. This illegal trade has become so lucrative that cattle from Bihar, Haryana, UP, Chhattisgarh and Maharashtra are brought to the state for this purpose, The Sentinal reported. Cattle are being smuggled into Bangladesh through the riverine border in Dhubri district. BSF sources said interrogations of several arrested smugglers have revealed that the traders are bringing cattle from some Indian States too for supplying to Bangladesh. The riverine border in Dhubri is preferred by the smugglers as a trade route as nearly 44-km of the border is unfenced and the BSF personnel patrol in boats. Of the 134-km border in Dhubri, 44 km is riverine boundary and still unfenced. This segment is often being used by criminals to smuggle cattle, drugs and other items. The state shares a 263-km border with Bangladesh in Cachar, Karimganj and Dhubri districts. On September 3, Assam Chief Minister Sarbananda Sonowal acknowledged that the border with Bangladesh is indeed porous and called for the Centre to deploy Army to fench the border. Sources told The Sentinel that cattle are brought in trucks from various states to Dhubri via Bengal and smuggled across the border. The smuggled cattle are subsequently taken to beef-processing units in Bangladesh. The meat is processed, packaged with preservatives and exported, mostly to West Asia, added sources. The market for smuggled cattle is thriving as a cow that costs over Rs 30,000 here can earn double the sum if sold to vendors across the border illegally. According to figures made available to this reporter, 2,969 and 28,704 cattle heads were seized by BSF in the Dhubri sector in 2014 and 2015 respectively. 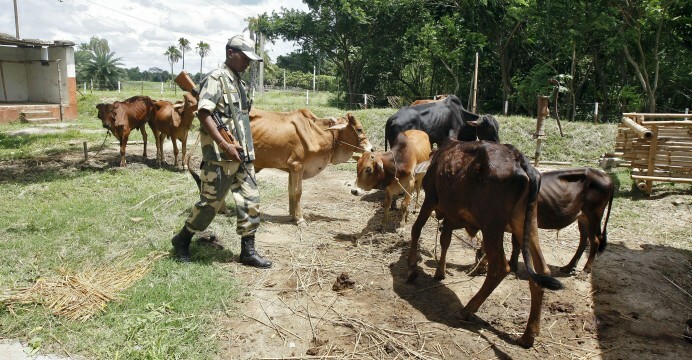 Security forces continue to seize large herds in Dhubri owing to the porous India-Bangladesh border in the district. The BSF has arrested 54 cattle smugglers till August this year, following 9 smugglers in 2014 and 32 smugglers in 2015.